For continuity, studies mentioned in this article involved participants that were competitive national to international level powerlifters or trained individuals with a minimum bench press training experience of 2 years [1,2]. The three grip widths are defined as, narrow, the bi-acromial distance, wide, the preferred grip and medium, the middle of the two [1,2]. bi-acromial distance is the horizontal distance across the shoulders measured between the acromion process (bony points) as shown in the picture below. Muscle activity, performance and injury risk were measured on a 1 to 6 rep max basis [1,2]. How Does Width Affect Muscle Activity & Joint Angles?? A quick comparison of joint across all three grips reveals that a wider grip is representative of a greater elbow angle, with increased shoulder abduction (moving away from the midline of the body), than the narrow and medium . This compares to the narrow grip width which has significantly smaller shoulder abduction angle and greater flexion angle than the two other grip widths . The greater degree of shoulder abduction in turn causes an increased level of forces through the shoulder joint during a wide grip bench press, whereas increased elbow flexion causes greater forces through the elbow during a narrow grip bench press . This in return impacts on muscle activation, with differences observed in prime movers when comparing the wide, medium and narrow grip widths . The wider grip had greater pectoralis major and anterior deltoid activation than the medium or narrow, with the narrow grip having significantly increased activity of the triceps brachii and decreased biceps brachii [1,2]. How Does This Affect Performance And Longevity?? 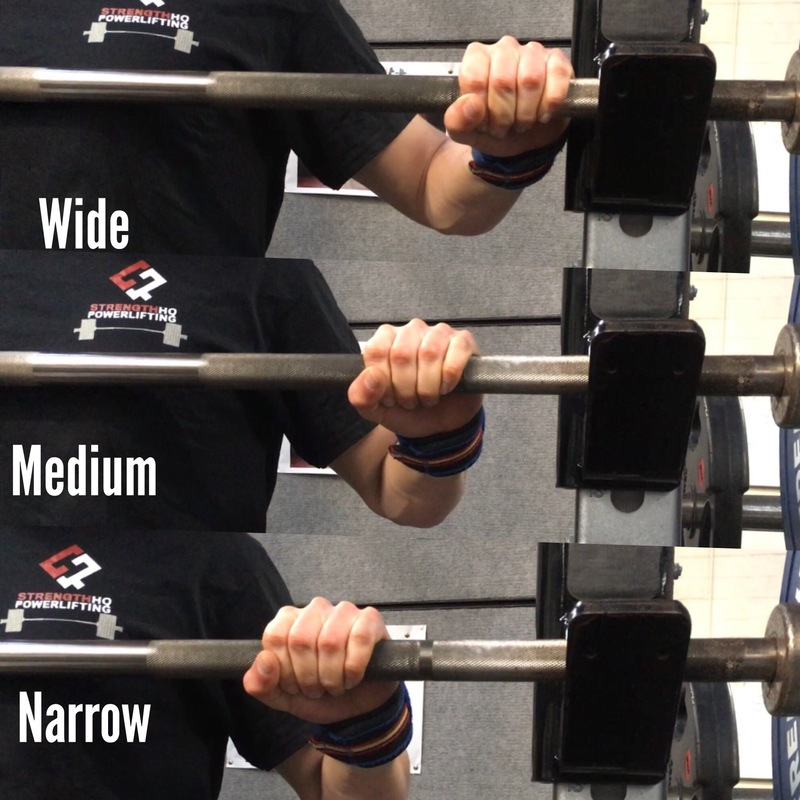 These aspects in conjunction with a lesser range of motion than narrow grip, result in greater average reps being achieved using a wide grip bench press, when comparing it to with the medium and narrow . However individual variations do exist, with some people who are triceps dominant or come from an athletic or bodybuilding background, benefiting from a moderate or even narrow grip. Injury Prevention And Practical Application Of Varying Widths. Though more effective in moving larger weight, there are large reports of pain induced during the wide grip bench press, with large associations with shoulder pain and injury . By utilising a narrow to medium grip width, the component angles of abduction can be decreased. Thus, the amount of peak torque and stress occurring at the shoulder joint will decrease and will reduce the risk of injuries to the shoulder and chest . Therefore, a coach or individual should utilise grip variations such as a narrow or even moderate grip bench press during training, to reduce stress on shoulders and pectoralis major [2,3]. This could be achieved by incorporating or replacing a preferred wide grip bench press day, with that of a narrow or medium grip, during early preparatory phases, when training volume is significantly higher. Additionally, a moderate or narrow grip could replace wide grip bench pressing for a duration of time, if an athlete is experiencing shoulder pain or discomfort, making it possible to maintain training volume, decrease risk of injury and adequate neuromuscular activation . This allows for longevity of the athlete and insures for continual strength adaption while still exposing the body to a somewhat sport specific movement pattern .